Details relating to the German Commemorative of 2017. This coin is the twelth in the German series which features the provinces. This year the province featured is Rheinland-Pfalz and Rheinland-Pfalz is represented by the Porta Negra (black gate) in Trier. The Porta Negra was much earlier a Roman city gate and is a well known land mark of Trier. It was previously known as “Porta Martis” or Gate oh Mars and presumably the Porta Negra appellation is due to the colouring of the sand stone through weathering. In 1986 it became part of UNESCO’s World Heritage Project. The motif is simply a depiction of the famous city gate. 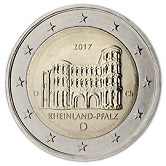 Under the image is the name of the province “RHEINLAND-PFALZ” and thereunder a “D” standing for Germany.The mint mark is between eight and nine o’clock and the sign of the designer is at around three o’clock. Finally, the year of issue 2017 can be seen above the image of the Porta Negra. Return from German Commemorative 2017 to euro coin collector.